It is a brilliant 4th-floor apartment with a lovely balcony. A modern 1 bedroom flat with 2 double beds and comfortably sleeps 4 people. There is a large bedroom with a double bed and as you can see in the photo's there is a second double bed in the corner of the lounge room and it remains private due to the divider. The flat is located less than 3 minutes walk away from Queens Road Peckham Station and is located above a supermarket that is open from 7am to 11pm everyday. 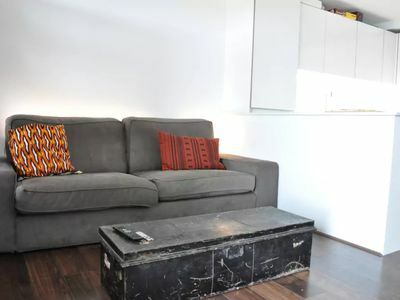 The flat is fully equipped with everything you need for a short or long stay in London. The flat is comfortable & modern with all amenities including TV, WiFi, dishwasher, washer & central heating. There are two comfortable double beds in the property and our cleaners place fresh, hotel quality linen on the bed just before your arrival. The flat offers a relaxing environment to 'de-stress' in after a busy day spent exploring the city. With a fully equipped kitchen, you will have the utensils you need to cook up some tasty treats. That said, you're in one the best cities for eating out with cuisine from all over the world.